Welcome to The Cutting Edge by the Blacksmith. We offer complete sharpening services along with expert blacksmithing all in our shop located in Oswego, Illinois. If it could be cut before, it can be cut again! When we sharpen an item for you it will also be balanced, returned to factory specs and polished if it is required. 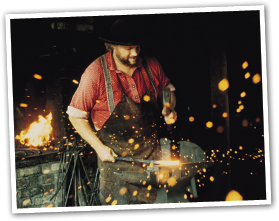 On the blacksmithing side of the business anything can be made from artwork to one of a kind hand tools. Restoration of antique tools and machinery...from one part to the whole thing! It is considerably less expensive to sharpen your equipment than it is to buy new. Sharper equipment worksfaster and get's you done much sooner. You will be saving energy because you won't be workingas hard to do a task. You can help preserve the environment by not throwing away old tools into landfills.